We decided to take a small day trip to Mackinac Island, located in the upper peninsula of Michigan, earlier this summer. I've been intrigued by the idea of visiting the quaint little island for the past few years. The lack of cars and the laid back vibe I've heard about seemed to be my kind of place! So, we made the 7 hour drive, boarded the ferry (about $70 round trip for the 4 of us), and headed over to spend a day soaking in the beauty of the island. The ferry ride lasted about 40 minutes, but there are other ferry companies that can get you over in half that time. We were just too cheap to pay for it. However, the slow ride allowed us to really soak in the beauty of the island ahead without feeling like it was whizzing by before we had to dock. Within a few steps of exiting the ferry, you are totally wrapped in many of the charms that the island has to offer. On the main street, you will find many shops and eateries, horse drawn carriages, and bikes galore. Since there are no cars allowed, you can either get around by foot, carriage, or bike. We decided to bike the perimeter of the island, so we stopped at one of the many bike rental areas to grab our rides. We paid $5 per hour for the single bikes, but you could also get tandems, speed, and comfort bikes for a few more dollars per hour. You are allowed to bring your own bikes over as well. Our first leg of the trip took us past the town library and some of the island's most gorgeous homes. Our bike tour also took us past beautiful landmarks like Devil's Kitchen and Arch Rock. Since there are so many horses on the island, the one downfall is all of the POOP! You have to be constantly on watch for it, otherwise you're bound to roll right through a big pile! We completed the bike ride around the entire island in just over an hour, and that included stops to take a few photos. I was pleased that most of the ride was on flat surfaces with only one or two minor hills that weren't too tough to ride up. I think most anyone who can ride a bike won't have any issues making the ride all the way around without too much exertion. Once we returned our bikes, we took the trails on foot, spending about 4 hours enjoying the views from inside and atop of the island. The town is filled with more charming houses and structures. But, the BEST part of the island is all the FUDGE! You can't walk through town without the heavenly scents of fudge hitting you at every turn. All of the fudge is made right in the shops, and it's a fun process to watch. 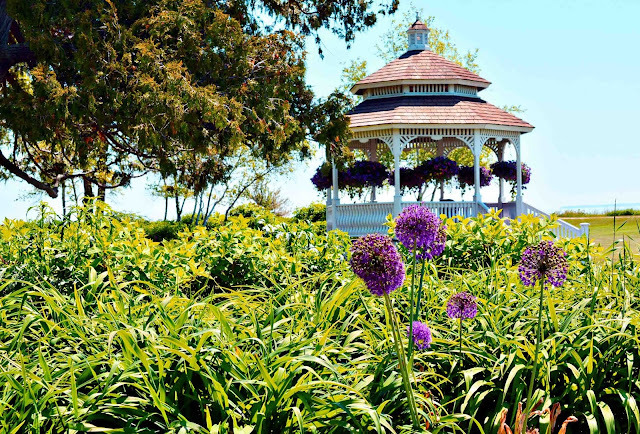 For us, we only needed a day to explore all of the wonders of Mackinac Island, but if you want to stay a while and relax, we hear The Grand Hotel is quite lovely. We didn't stop in on our tour, but maybe someday I'll return for a visit with just Jason to celebrate an anniversary. All in all, it was a lovely trip, and if you are in the upper peninsula of Michigan some day, be sure to add Mackinac Island to your travel plans. It's a destination you won't want to miss! Gorgeous photos and it looks so blue and white as if it is near the ocean! I imagine I would have had a ton of zucchini growing with all the poop laying around ;) I thought they'd have bags on the back of the horses to catch it, but I guess it's just easier to have someone come around and scoop it up as soon as they can. I don't know about poop laws here. I do know that in Amish country you'll find a ton of poop on the side of the road from all the horse buggies they use. I figure if I have to pick up my dog poo, there really should be a law that applies to horses too. Blah to all the poop, but horses have to go too. Sure looks like an amazing spot. I swear there is a house here like that yellow one that is almost identical to it. That yellow one was my favorite. A dream home located right across the street from the library, park and water. You don't get any better than that! Such a beautiful place, AND fudge, too! That's for me, (smile). That place looks like so much fun! I'd love to visit there. It looks like they have a lot to do too! The little shops style wise remind me of the ones in Savannah, Georgia. You and the boys would love it there, Alissa! There's a fort that I think the boys would get a kick out of at the top of the island. Allison tried scaling the walls (before reading the "no climbing" sign lol) and found it impossible to do. BWahahahaha. Watch out for poop. That is hilarious. We have a lot of horses in our area, too, and there's always manure somewhere. I've heard about this place and am definitely intrigued by the idea of NO CARS! I'd love to check it out with my family. Beautiful images too! This reminds me of a place we used to vacation as a family. I always loved riding our bikes around! Sleeves. Jason will have to wear sleeves. My FIL went down into the hotel lobby with a tank top (it was hot, lol) and they sent him right back to his room to get sleeves. ;) I love Mackinac. My daughter thinks it's the best place ever made. They have good food there too. Me and my two youngest biked all day in the rain there once. It was a blast! Glad you had a nice time! The sleeves sounds a lot like Ruth's Chris policy. The refused to let in a friend of ours who wasn't wearing a tie with his dress shirt. We seriously thought about kayaking over to avoid the ferry charge lol. 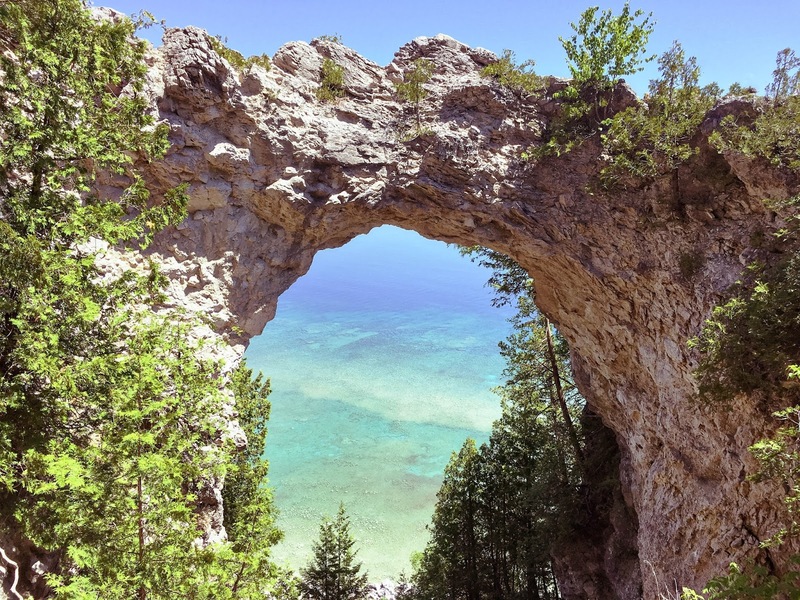 Wow, Mackinac Island looks like it hasn't changed a bit. It's still beautiful! I miss that fudge! The scenery looks amazing...except for the horse poop. That would be our son's favorite part though! I would absolutely love to take a trip out there! It looks like so much fun! It looks like an absolutely place to visit. So gorgeous and such lovely photos. Would love to visit there. This is a nice adventure! I love the pictures, although the poop makes it awkward. I'm surprised the horses don't have the little diaper catchers on the buggies! I would be in that dessert shop for the chocolate fudge everyday! Love, love, love Mackinac Island! I feel so blessed that it's a super short drive for me to get there. I could think of so many adjectives to describe the pictures of this place: gorgeous, peaceful, serene quaint...I could go on and on. This looks like a beautiful place to visit. This would be an amazing place to explore. I would love to go on the bicycle tour. These are fantastic photos. I was there in college and loved biking around the area. Need to go back and bring the kids! Loved it! I haven't been to Mackinac in 20 years! I keep telling my husband we need to take a trip there with our kids! I would adore visiting here! I have never taken a ferry ride before and it sounds lovely! oh this looks like my kinda place too!! :) what a wonderful day to spend there and yes, you should definitely return for a stayover I think.. This looks like such a fun place to visit. I love that you got to get out and make memories with your family. Everything looks so lovely, except for the poop of course lol. This looks like a wonderful family day! Nice place, I wish I can travel around the world but I hope I will not encounter a poop like that. Oh my goodness, this looks gorgeous! Not to mention, you took really pretty pictures. Looks like a great place to visit (horse poop and all hehe). I can't believe my eyes, wow! Seeing blue and beautiful around that place makes me feel like I want to live there, and the poop doesn't even make me think twice about going in a different direction!